In honor of Father’s Day this weekend, I decided to do a 2-for-1 review honoring two of my favorite anime and their unique takes on fatherhood: Usagi Drop and Amaama to Inazuma. Anime, as you know, is rife with all kinds of parents: the good, the bad, the dead. For the purposes of this review, I will be referring to the anime versions ONLY of Usagi Drop and Amaama to Inazuma. I do have to thank WatchMojo for mentioning Usagi Drop in one of their videos as I had never heard of it up until that point. In comparison to most other anime, Usagi Drop is the most realistic. The characters feel like they could exist in our world, encountering the same types of problems and going about life the same way. Plus the art style is adorable and really lends itself to the type of story this anime tells. 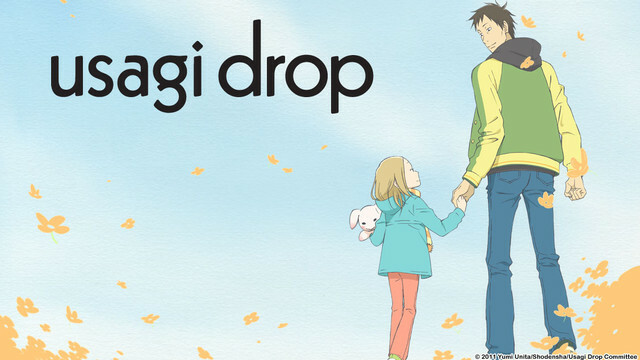 Usagi Drop maps out the trials and tribulations that come about when a barely-qualified adult becomes a guardian to a child–or in this case, his grandfather’s illegitimate 6-year old daughter. Rin, much in the same way as rabbits are treated by novice owners, was being cared for by her extended family after her father died. Upon hearing about her circumstances, suddenly no one wanted to care for her. They were prepared to abandon her in an orphanage. When Daikichi offers to take care of her, the situation seemed almost as if a little rabbit had been dropped into his lap (Get it? The title is Usagi Drop/Bunny Drop). Throughout the series, it’s both funny and heart-warming to see Daikichi–30, unmarried, and unimpressive–became a pretty good guardian. Right off the bat, he cares for Rin despite having met her under unusual and unfortunate circumstances and despite her being very shy and withdrawn. Daikichi has no idea how to raise a child, and it shows. To be frank, he bumbles. The way he reacts to the first time Rin wets the bed to trying to figure out what to do when she has a fever shows how little he knows about raising a child but also how much he cares. Another reason Usagi Drop is so unique in the anime world is that despite Daikichi being related to Rin, he and Rin are little more than guardian and ward. I always applaud anime that push the boundaries of the norm. Most of the time in anime, when you see a parent and child pair, they were raised as parent and child–unlike Daikichi and Rin. Perhaps for this reason, perhaps this is because that’s just how Daikichi’s parenting style is, Daikichi does not treat Rin with kid-gloves. He allows Rin to make the choice whether she wants to see her estranged mother or continue to live with him. Put all this in contrast to Amaama to Inazuma (Sweetness and Lightning) where the main pair are a father/daughter duo. As embarrassed as I am to admit it, I cried during this anime on at least two separate occasions. Even more embarrassing, this is not meant to be a sad anime. It’s supposed to be a heart-warming, feel-good, cooking anime. However, it does address possibly even more sensitive issues such as death and grief in the eyes of a child and methods of parenting. What I ended up liking about both Amaama to Inazuma and Usagi Drop was that the children, Tsumugi and Rin, act like children. One of the biggest turn offs for me to a series is the fact that they were very clearly written by adults. Children have a limited range of vocabulary and can only deliver certain emotions realistically. Both series have their respective kids acting like kids. What really sets the tone for the show is the way Inuzuka-sensei and his daughter, Tsumugi, interact with one another and people around them. From the get-go, it’s clear Inuzuka-sensei is not the stern parent type we sometimes see in anime such as Neon Genesis Evangelion’s Gendo Ikari but neither is he goofy and ridiculous like Echizen Nanjiro from Prince of Tennis. He’s a widower who, despite losing his wife, does not succumb to despair but instead remembers he has a very young daughter who also just lost her mother. Throughout the series, Inuzuka-sensei must find a balance between being a parent who knows how to control his child when she acts up but also be kind and loving so as to fill the void left behind by his wife for his daughter. It manages to hit that good balance between showing a life Inuzuka-sensei and Tsumugi build together that is full of fun, love, and good food, but also addresses the difficulties that arise when your world is turned upside down by an unexpected death. What both series do so well is display something that anime doesn’t often call attention to–the tenacity of children. Both Rin and Tsumugi, despite losing core people in their lives, manage to heal and smile and laugh again with the help of their respective father figures, once again going to show the impact a dad can really have. I am currently midway with Amaama series and I get what you mean. It’s so heartwarming that it makes you tear up sometimes. Haven’t tried usagi drop though. At first , I thought it meant rabbit’s dung. The show sounds promising. Does it have any interesting side character btw? Thanks for the good read. The show is amazing. There aren’t too many recurring, interesting side characters that won’t give you spoilers, but my favorite side character is Daikichi’s grandfather. Definitely give it a go. If you liked Amaama, Usagi Drop is definitely up your alley.